LeBron James is a terrible leader. You might be surprised to think this opinion can possess such a shelf life, given that LeBron has reached a sixth straight NBA Finals, the best display of uninterrupted annual consistency in this league since Bill Russell. However, the constant media circus surrounding No. 23, fed by national carnival barkers who love to move the needle by saying outlandishly overstated things about him, creates for many an enduring sense that Bron Bron really doesn’t inspire his teammates. LeBron is the man who must ultimately take matters into his own hands. He is the centerpiece of the Cavs, and one can see in Miami that the Heat are no longer a Finals-level team without him. As a scorer, facilitator and defender, LeBron is so much of a doer that his ubiquitous presence conveys selfishness to many. A lot of fans process LeBron’s performances as the sole sources and creators of his team’s results. What he does for (and with) teammates is viewed as peripheral to the conversation at best, nonexistent at worst. It’s true that LeBron casts a large shadow over the organizations he plays for, the cities he plays in, and the coaches who accompany him on every gamenight. This emotional and contextual reality creates the appearance of runaway individualism, the antithesis of leadership. Yet, the appearance of runaway individualism isn’t the actualization of the same. LeBron is a larger-than-life individual performer, but from that individual identity comes a team-oriented style of play and a presence which has — once again — stabilized a team on the road to an NBA Finals appearance. The body-snatched Game 5 at home against the Boston Celtics in the 2010 Eastern Conference semifinals represented the low point of LeBron’s career. Failing to win wasn’t the issue; great athletes fail to perform from time to time, because no one is immune to that law of nature. The problem was that LeBron didn’t comport himself the way a player of his stature should. He didn’t merely fail to make shots in that Game 5 against the poised leaders of the Celtics; he dragged down his team with his attitude. In Game 6, LeBron had to win in Boston, something he wouldn’t learn how to do (in an elimination situation) until 2012 with the Miami Heat. He played reasonably well in that game, but Game 5 — at home — marked the moment when his first go-round with Cleveland flew off the rails. LeBron didn’t yet know how to lead a team in 2010. In 2011, he realized he didn’t yet know how to handle the thinnest air of championship pressure, when he shrived in the glare of the Finals against the Dallas Mavericks. In was on that night in Boston for a Game 6 — not 2010, but 2012 — when LeBron James led by example. Ever since that moment, Bron Bron marked himself as a next-level NBA leader. Proof of that leadership ability emerged in this just-concluded East Finals series against the Toronto Raptors. 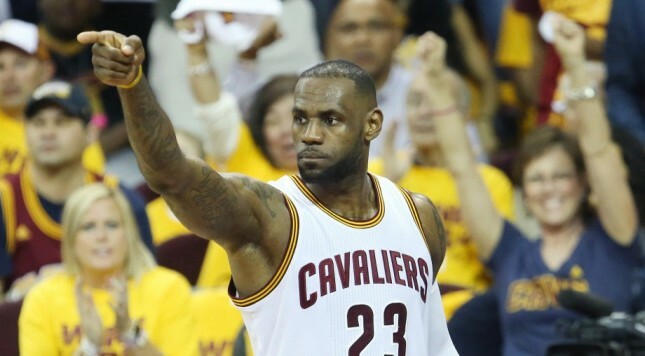 After Toronto surprisingly won consecutive games to knot the series at 2-2, LeBron came home to Cleveland for Game 5. He was presented with the same situation he faced in the 2010 East semis. His Cleveland career had come full circle. The Cavs were given one last chance to choke away an Eastern Conference title they were always favored to win. Would Cleveland wobble in the face of fresh pressure after starting these playoffs with 10 straight wins, or would the Cavs — unlike 2010 — reassert themselves in the strongest possible manner? Does a 38-point Game 5 win, followed by a 26-point Game 6 rout on Friday in Canada, serve as enough evidence to show how stable LeBron has made these Cavs? Do those two thumpings sufficiently illustrate how much LeBron has grown as the leader in the locker room and on the court? Some people STILL won’t be convinced… but that’s their problem. It certainly ain’t LeBron’s. This isn’t 2010 anymore. Deficient leaders don’t make six straight NBA Finals.